Do you care about social justice? Are you interested in radical education and working with children? Do you want to help ensure the continuation of an important campus organization? Help run Julia’s Star next year! Julia’s Star is a group of students who use a children’s book written by a (now deceased) Wes alumna to teach students in Middletown about the importance of diversity and the dangers of stereotyping. All of our members will have graduated as of May, and we want to keep the group going, especially given that the author of the book was an important part of the Wesleyan community. This is a small time commitment in the fall and anywhere from 5-20 hours in the spring.Working on J Star next year will give you the opportunity to make the club your own, to have an impact in Middletown, and to leave your mark on the Wesleyan community. 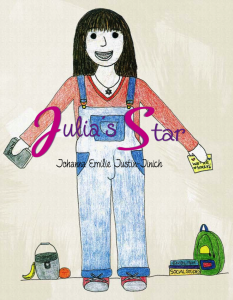 Julia’s Star is a children’s book written by Johanna Justin-Jinich. It tells a story about the injurious effects of intolerance, and how curiosity, friendship, knowledge and trust can overcome prejudice. Every spring, several Wesleyan students use this story to start a discussion about difference and how to understand/appreciate diversity of others with elementary schoolers around Middletown. This project is about talking to children in an honest and real way about prejudice and stereotyping. Diversity training is not part of Connecticut state curriculum, but we feel it is essential for students to grow up with the vocabulary to talk about prejudice, to know how to ask each other questions, and to learn to embrace and enjoy difference. This is a special project that encourages important conversation about difference while honoring the memory of Johanna Justin-Jinich by sharing the magic of her book. If you want to learn more, please email tkaplan@welseyan.edu.